← Muslims Believe In A Secular Democratic State Or Rightly Guided Khilafah? Rather than I try to answer, I’m posting below a very good answer to a similar question written by a forum user in an online forum called TurnToIslam.com. Question by Islam! !yay: If muslim nations unite, wouldnt that be worst? Im talking about economically. The overall GDP of Muslim countries worldwide is about 7 trillion dollars. But that money would have to spread among billions of citizens living in the country. And per capita each will earn ,I dont think will be very much. Like in qatar per capita is about 86 thousand dollars , but if qatar were to unite with other Islamic countries i think their per captia will drop drastically and everyone in that country will earn less. Im asking if that would happen If all Islamic countries were to unite and would their per capita drop if they unite? Answer by NyereKareem: There is more to uniting the Muslim Ummah than lumping all Muslim majority nations into one state. Will we really be united? What i mean is will there still be tribal differences, sectarian difference, racism against fellow muslims etc. Remember brother, that GDP and all that other economic stuff are things of hayatul dunya. 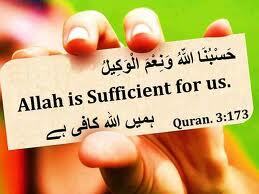 It matters in a sense, but in the long term it doesn’t because none of it will help us on yawmul qiyamah. We muslims no matter where we are in the world are looked down upon. That’s why the disputes amongst many of us Muslims are silly because we are very much reviled by the rest of the world. So who cares if you are an Arab from such and such a family, or if you’re from such and such a tribe in Pakistan? The enemies of Islam hate Muslims from wherever they are. 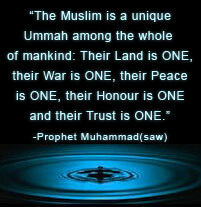 That’s why all Muslims; Black, White, Arab, Asian whatever need to stick together to propagate the religion of Al Islam. We can do this if we’re willing to let go of the parts of our cultures that conflict with Islam. This entry was posted in Afghanistan, Arabs, Caliphate, Central Asia, Egypt, Governments, India, Iran, Iraq, Islam, Islamic World, Khilafah, Kuwait, Lebanon, Media, Middle East, Misconceptions, Moors, Muslims, Pakistan, Palestine, Propaganda, Religion, Saudi Arabia, shia, State Of Islam, Sudan, sunni, Syria, Thoughts, Tunisia, Turkey, UAE, Ummah, Uzbekistan and tagged islamic countries, muslim countries, Muslim Countries Union, muslim nations, muslim ummah, Unitying Muslim Countries. Bookmark the permalink.